The aroid, or Araceae, family includes three plants known as "voodoo lily." So named for their flowers, which are unusual in color, shape and fragrance, these plants are quite dramatic. The blooms comprise a finger-like spadix with a cloak-like spathe and range in color from cream to blackened red-purple. DormantvVoodoo lilies should be overwintered indoors in cold winter regions. The Dranunculus genus includes three species of herbaceous plants native to the area around the Mediterranean Basin. Planted as tuber roots, in the warmth of spring or summer these plants grow upright flowers that smell of rotten flesh. They are grown in outdoor landscapes in USDA Hardiness Zones 7 through 9. 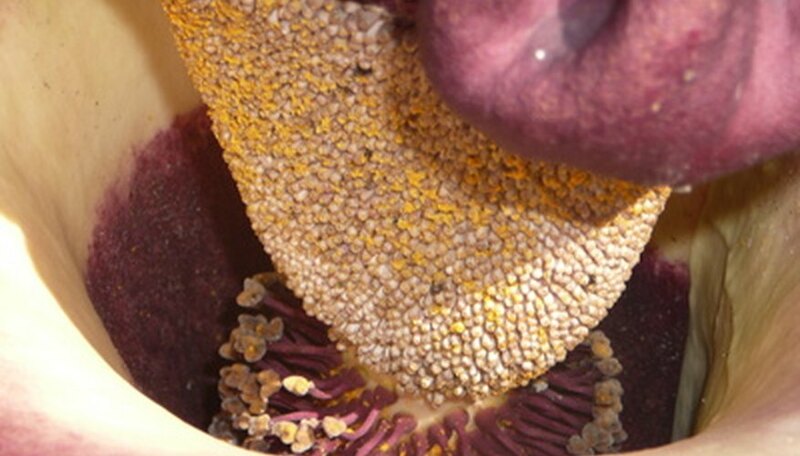 Dracunculus vulgaris, sometimes called dragon arum, has a large maroon-purple flower that truly stinks. The Sauromatum genus has two species of plants called voodoo lily that are native to tropical Asia and Africa. These plants send up their arum flowers before the leaves emerge later in summer. The smelly flowers are spotted and purplish-red in color. They can be grown in landscapes outdoors in USDA Hardiness Zones 7 and warmer. Sauromatum venosum is also called monarch-of-the-east. Native to the warm woodlands of tropical Asia and Africa is a large plant genus called Amorphophallus. Sometimes called voodoo lily, but also devil's tongue or snake palm, there are nearly 100 different species. They have large, ornate leaves and large flowers, much larger than the two types already mentioned. The flowers range from 12 to 60 inches in height and produce choking scents of rotting meat. Three species of note for garden enthusiasts are Amorphophallus konjac, Amorphophallus titanum and Amorphophallus paeoniifolium. They are grown outdoors in USDA Hardiness Zones 9 to 10 and warmer. When Do Elephant Ear Plants Flower?